Railways has made windfall gains with the introduction of dynamic fares in the special Rajdhani type trains in the Delhi-Mumbai sector, which saw up to a 30 per cent jump in fares in AC-2 and 35 per cent in AC-3. An AC-2 tier fare fetches Rs 3,232 per ticket, an increase of Rs 737 from the base price of Rs 2,495. Similarly the AC-3 ticket is Rs 2,442, a rise of Rs 627 from the base price of Rs 1,815. The trip for December 24 is booked to capacity with 746 berths sold out in AC-3 and 219 berths exhausted in AC-2 class. The special train is equipped with 17 coaches. The ticket fares have gone up by as much as Rs 737 in AC-2 and Rs 627 in the AC-3, reflecting the huge rush for seat in the special train, said a senior Railway Ministry official. The AC special premier train will operate on December 27, 30 and January 2, the booking of which would be done only through IRCTC ticketing portal. Dynamic fares have been introduced for the first time by Railways to shore up its finances from passenger segment and woo more and more passengers from airlines by providing better facilities and services. Railways has vouched for punctuality of the special train which will have no stoppages in between. The train will leave from here at 2.50 PM and arrive at Mumbai Central the next day at 6.55 AM. In the return direction, the train will leave from Mumbai Central at 4 PM (December 26, 29 and January 1) and arrive here at 7.55 AM next day. The special trains have been launched with costlier tickets to encash the peak demand during festive season of Christmas and New Year. dynamic fares are prevalent in air fares and it is for the first time that Railways has decided to run trains on this pattern. 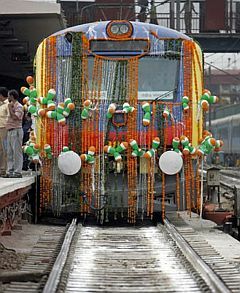 The premier AC special trains will have only AC-2 and AC-3 classes with Rajdhani-like facility including catering. The increase in the existing fare depends on the demand intensity, said the official. The fares applicable for each day or transaction shall be indicated at the time of booking on the IRCTC's e-ticketing website. Catering shall be provided onboard and catering charges shall be part of tariff like the premier service of Rajdhani and Shatabdi trains. The official said as the train is designed to clear the last-minute peak time demand and has no stoppages en route, no concession shall be applicable to this train. There will be no waitlisted tickets and there will be no refund except when the train is cancelled on railway account due to unforeseen circumstances or due to severe disturbances affecting operations. Dynamic pricing is already being applied in freight business. Currently, the loss in passenger sector is touching Rs 26,000 crore in a year and it is being cross-subsidised from freight earnings. "Passenger business should not be making loss. The waiting list of passengers is getting longer and longer, then why should passenger business make loss?" the official asked, adding many are willing to pay for travelling safe and comfortably. He said if the experiment becomes successful then similar trains will be launched on other sectors like Delhi-Kolkata. The passengers are required to carry the prescribed original photo identity card which is used at the time of booking. At present, there are two Rajdhani trains for Mumbai.